I acquired a non-working Apple III over the weekend from VCF SE. It is surprisingly clean (I think the just-previous owner really cleaned it up) but as advertised, it does not work. Power is good- I get 5v, 12v, everything there tests fine. It has a 12v 128k RAM board in it. I have removed all the chips and reinstalled them, checking for proper positioning and bent legs. I didn't find any problems, and none of this affected the screen output. I've even moved around the RAM (within the same bank only, it has a mix of 8k and 4k chips). When I turn it on with everything installed, I get this screen. 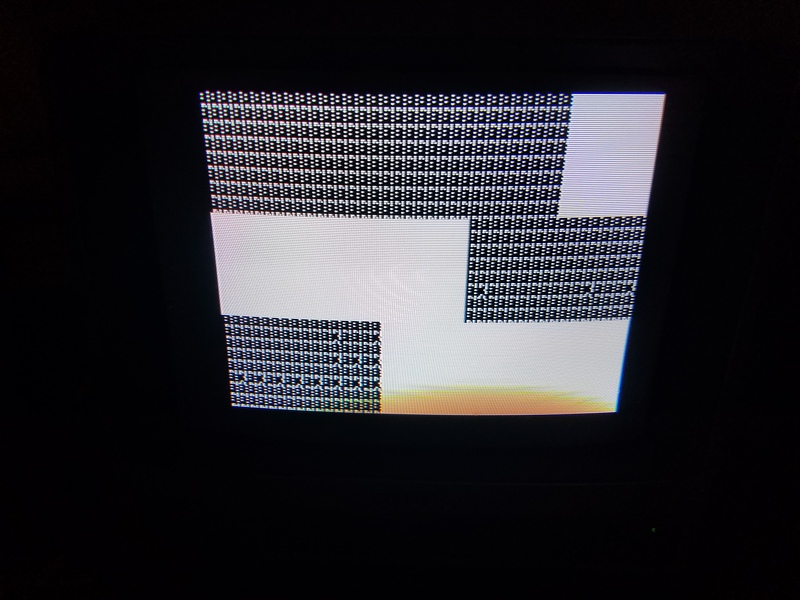 If I remove the memory board, I get this screen, but it's not static- the dots move around like a TV tuned to a dead channel. BTW, it does the exact same thing without the CPU installed, so I don't think that's even running. I think the screen is black if I remove the ROMs. I might suggest reseating the IC's on the motherboard. I think all teh IC's under the mem board is related to driving memory. No luck. I removed, checked the legs, and re-seated every chip on the board, twice. I tested all the 4116 RAM, one was bad, replacing didn't change anything. I tested all the pins on the chips to the corresponding pin on the bottom of the socket (bottom of board) - this was tedious, but I didn't find any breaks. The symptom is the same. I don't think the CPU is running at all, since removing it has no effect. I don't think there are schematics out there for the ///? I also have no way to test the 8K RAMs. I don't suppose 4K RAMs can be swapped in like the second row is? (They leave one row of pins unused in the sockets). Do you have the service reference manual? I've already spent too much time on a machine I don't really care about. Does anyone want this machine? I'll take some photos- it's in great physical condition. PM me photos of what you have and I will make a decision in short order. Thank you. I'd buy your machine in a flash, but as I'm in AU, then the shipping would be a killer. CPU does not seem to be working? Is it held in a permanent reset state? 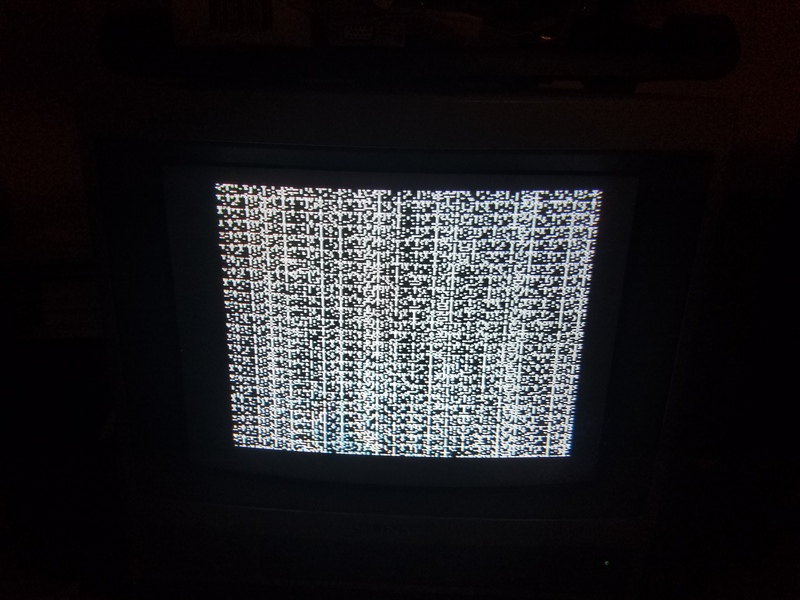 Check that 6502 pin 40 changes state when reset pushed. Is the CPU getting a 1 or 2MHz signal on pin 39 or pin 37? The Apple III can be switched in software (? environment register $FFDF bit 7) from 1 to 2 MHz. Is this system working or broken. That is: a clock signal of 1 or 2MHz should be on 6502 pin 39 and pin 37. Check the clock generation circuitry. There are 4 x 74LS161 counters used as dividers for the 14MHz signal. Are these chips all working? If you don't have a chip tester, try them in an Apple II as it has a similar clock divider circuitry. A common fault is to remove a card whilst the computer is active, this might blow one or more bus buffer chips. Check the tri-state bus transceivers. I suspect that they are the same as the Apple II, but without a III machine in front of me I can't be sure.